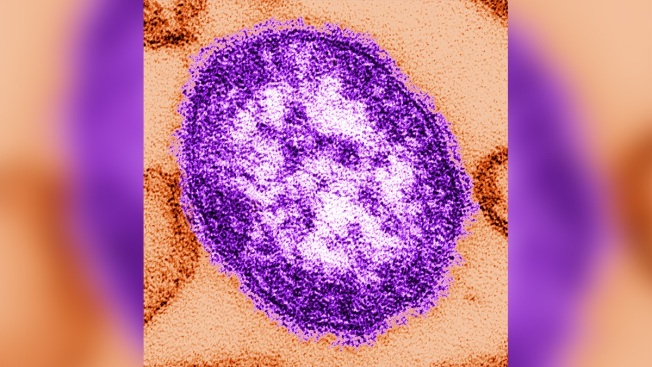 This undated handout from the Centers for Disease Control and Prevention shows a single virus particle of the measles virus. A Wisconsin man has been criminally charged with breaking a measles quarantine by leaving his home to go to the gym, according to court documents. Jeffery Murawski, 57, of Brookfield, was charged Feb. 22 with a misdemeanor count of willfully violating the recommendations of a local health officer or subjecting others to danger of contracting a communicable disease, NBC News reported. His wife, Christine Bennett, 58, was charged with the same misdemeanor for allegedly aiding him in taking actions that could have exposed people in a public place to a communicable disease. It is unclear if Murawski had measles at the time or was under quarantine in case he was infected.